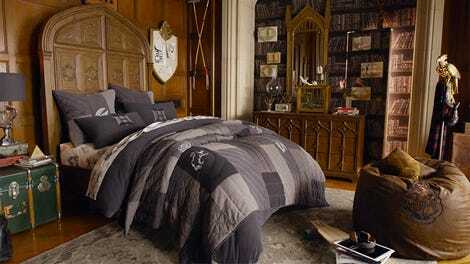 As a kid, I would have been ecstatic to attend Hogwarts instead of my boring public school. But given the choice as an adult, even the promise of magic isn’t enough to convince me to ever go back to school again. Why would I spend years studying textbooks and practicing potions when JAKKS Pacific’s new Wizard Training Wands fast-forward me right to the best part of wizarding: running around with wands and blasting spells? During my time at Hogwarts’ correspondence school I trained using three different wands modeled after the magical sticks wielded by Harry Potter, Dumbledore, and Voldemort—aka he who must not be named—aka he who doesn’t actually appear on the toy’s packaging. Either Ralph Fiennes is very protective of his image, or just ashamed at how he looks without a nose. They’re a little thicker than the actual Harry Potter prop wands, but you don’t have to completely rely on your imagination with these. Having never attended the actual Hogwarts or had Ollivander choose a real wand for me, I can’t say for certain if these feel like the real thing. But I have handled expensive prop replicas, and these are just as satisfying to flick around in the air. They’re a little thicker, however, to make room for electronics, a tiny speaker, and three AAA batteries that power the wands instead of phoenix feathers or dragon heartstrings. There’s no exotic woods used here either—at $25, each design is a plastic-on-plastic affair. Voldemort’s, Harry Potter’s, and Dumbledore’s wands. Dumbledore’s wand has the fanciest detailing, but Harry’s simpler design is the most comfortable to hold. And as much fun as it is to be the heel, the hook on the end of Voldemort’s wand makes it nigh impossible for southpaws to comfortably hold it in their left hands. Tom Riddle clearly chose form over function for his magical weapon, and maybe we now know the real reason he was defeated by a teenager: ergonomics. The hook on the end of Voldemort’s wand makes it tricky for southpaws to wield. Although the simplest design, Harry Potter’s wand was the most comfortable to hold. 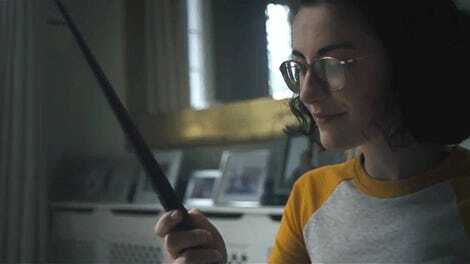 To make them muggle-compatible, the wands use a combination of buttons and motion-sensing electronics to activate their imaginary capabilities. There are five modes of play, with four of them involving a series of 11 different spells that can be triggered by waving the wands around in the air in specific motions. You’ll work toward memorizing 11 different wand motions for casting various spells, but at times it can feel like actual homework. This is where those of us with limited or precarious attention spans might get frustrated. There are modes that make learning and perfecting each of these specific spell motions less of a chore, but at times it can feel repetitive as you struggle to find the exact motions the internal gyroscope hardware is looking for. There’s certainly a feeling of satisfaction when you’re able to reliably cast one of those 11 spells, and there’s a quick-draw mode that lets you compete with others to see who can cast spells the fastest. But the real appeal of these wands is the Wizard Tag Mode, which ignores the spells altogether and simply allows multiple aspiring wizards to run around and shoot magical blasts at each other. Wizard Tag Mode uses the wand’s light-up buttons as a power meter, registering hits by turning the buttons off one-by-one. The mode buttons on each wand light up to indicate each player’s health (and turn off one-by-one every time you get hit), while a cast button is essentially your magical weapon’s trigger. Get hit five times, and your wand is out of commission. As long as you’re not expecting the same kind of range and accuracy that something like Nerf’s new Laser Ops Pro blasters deliver, there’s definitely some fun to be had here. I found the wands maxed out at detecting hits somewhere around 15 to 20 feet away from each other, and at close range—just a couple of feet apart—you don’t really need to aim your wand to damage your opponent. It’s clear there are no lasers in use, and if you’re looking for an experience that rivals an afternoon at the paintball range, you’ll want to just go do that instead and pretend those little balls of paint are magical dragon eggs or something. This is a kid’s toy, and will undoubtedly provide a fun experience to anyone under 10. They’re not the same as going to Hogwarts, but $25 is a lot cheaper than paying tuition. 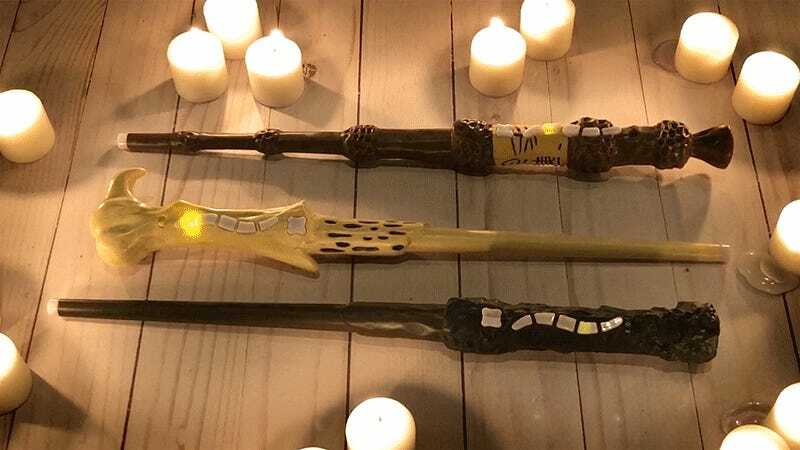 Perfect replicas of the wands used throughout the Potter world can be found for around $30 to $40 if you’re just looking for something to display. But nobody walks away from a Harry Potter movie wanting another piece of decor. 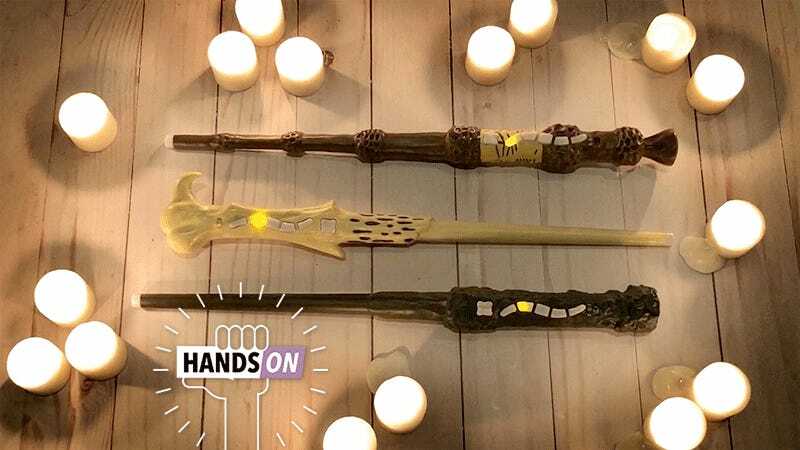 You want to be a wizard and go to Hogwarts, and if you’re OK with a little more studying in your life, it won’t actually take that long to masterfully conjure all the spells these wands can simulate.